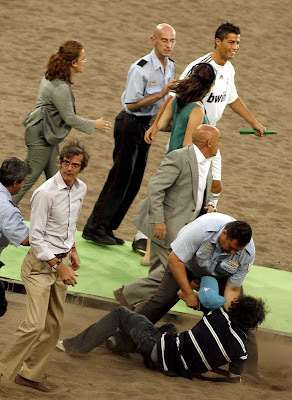 Tonight's event at the Santiago Bernabeu has all the makings of an historic evening. At 21:00 CET, thousands of fans will welcome the newest idol of the Madridista family. Hours prior to even landing in the Spanish capital, Cristiano Ronaldo's arrival has generated so much hype that hundreds of fans already gathered around the confines of the stadium to ensure they are one of those lucky enough to witness the unveiling of Cristiano. By 9:00 dozens of fans already lined the walls of the Santiago Bernabeu. The crowd had grown to hundreds only two hours later. Flags, shirts, signs and everything else you can think of to welcome a player who even before his official presentation has become an idol of Madridismo. Cristiano Ronaldo has arrived Madrid, the city in which he will live for at least six years. The player came in a private flight and landed in Torrejon close to 12:30. He will then head to Sanitas La Moraleja Hospital to have his medical examination prior to visiting the Santiago Bernabeu Stadium. The expectation couldn't have been any greater as hundreds of sign-carrying, flag-waving Madridistas welcomed Ronaldo to the Santiago Bernabeu. Once inside the facility, he met with Director General and Presidential Aide, Jorge Valdano. Ronaldo sat down for lunch at Puerta 57, one of the three restaurants located inside the stadium, alongside fellow countryman, idol and friend, Eusebio. The best Portuguese player of all time was invited by Real Madrid to attend Cristiano's presentation and have lunch with the several members of the Ex Players Assocation including Alfredo di Stefano, Amancio, Butragueño, Pachín, Zoco and Santamaría. It's been a long day but the heat didn't stop thousands of fans from waiting patiently for the doors to open. At 19:00, Madridistas decked out with all their paraphernalia and signs swarmed through the gates in orderly fashion to fill the Santiago Bernabeu, which took only a matter of minutes. Cristiano Ronaldo officially plays for Real Madrid. The Portuguese international signed his contract at 20:00 CET in the Board room of the Santiago Bernabeu. Real Madrid President, Florentino Perez congratulated the player and wished him the best of luck. Never in the history of any football club had the presentation of a player been so anticipated. 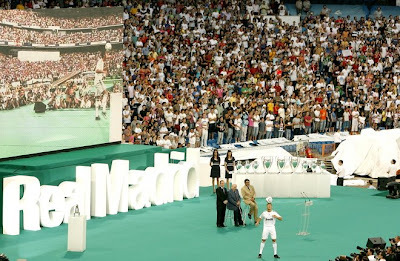 Today, over 80,000 fans gathered at the Bernabeu to greet Ronaldo as a Madridista. The player was received with a wild roar. He said a few words and greeted many fans on the stands. Cristiano Ronaldo gave his first press conference as a Real Madrid player following his presentation. The Portuguese star highlighted that it had always been his dream to play for Real Madrid and that he was overwhelmed by the reception the fans had given him.